E. Downing, Mechanical Eng. Dept., Stanford University, Stanford, CA 94305-4035, USA;(415) 725-3288, downing@kaos.Stanford.edu. L. Hesselink, Electrical Eng. Dept., Stanford University, Stanford, CA 94305-4035, USA. J. Ralston, SDL Corp., 90 Rose Orchard Way, San Jose, CA 95134-1365, USA. R. Macfarlane, IBM Almaden Research Center, 650 Harry Road, San Jose, CA 95120, USA. A three-colour, solid-state, volumetric display based on two-step, two-frequency upconversion in rare earth doped heavy metal fluoride glass is described. The device employs infrared laser beams that intersect inside a transparent volume of active optical material to address red, green, and blue voxels via sequential two-step resonant absorption. Three-dimensional wire-frame images, surface areas, and solids are drawn by scanning the point of intersection of the lasers around inside the material. The prototype device is driven with laser diodes, uses conventional focusing optics and mechanical scanners, and is bright enough to be seen in ambient room lighting conditions. The ability to visualise real-time volumetric data in true three-dimensional form has been a goal of display development efforts for many years. Several clever techniques have been developed, but none has provided a complete solution for the need to view dynamic volumetric data in a realistic interactive format. In this paper we present a volumetric display technology that is capable of displaying real-time three-dimensional objects in true 3D spatial form. The device can be viewed from any perspective, through all sides of the display volume, and does not require the assistance of any special glasses or headgear. The device features unencumbered viewing access to multiple users simultaneously, and is capable of displaying information using the three additive primary colours red, green, and blue. Three-dimensional perception is a complex cognitive process involving the eyes and the brain as a visual system. Historical solutions to displaying 3D information are diverse and varied, and have often relied on tricking the human visual system into thinking that it is seeing a 2D scene in three dimensions. While specific system requirements vary for different applications, a successful three-dimensional display should provide the viewer, to the necessary extent, with a number of intrinsic visualisation parameters. These parameters include the field of view, which is defined by the solid angle subtended by the object, and thus determines the apparent size of an object as seen by the viewer, and the viewing zone, which is defined as the range over which the user or users can move and still see the objects displayed clearly in the field of view. Autostereoscopic viewing is the ability for the displayed objects to be continuously viewable from all regions within the viewing zone, and accommodation is the ability for the user to focus on selected depth planes within the object. Dynamic and real time capabilities allow moving objects to be displayed at a refresh rate sufficient to avoid flicker (30-60 Hz), and interactive capability allows the user to modify objects being displayed, i. e., zoom, translate, rotate, cut and paste. Colour refers to the ability to address three primaries such as the additive red, green, and blue (RGB), from which to produce a wide spectrum of colours, including white, by appropriate mixing. Many of the systems that have been developed to date, such as holographic and stereoscopic displays have limited viewing zones and usually present static images, or images with very low resolution. Others, like virtual reality displays require the user to wear special headgear that interferes with normal visual processes. Display approaches in which two-dimensional reflective or emissive surfaces are swept throughout a third dimension have been demonstrated, but they too have restricted viewing zones and require large surfaces to be deflected or rotated at high speeds. The traditional two-dimensional cathode-ray tube (CRT) and liquid crystal displays (LCD), in which dynamic 3D scenes can be rendered using appropriate graphic constructs such as shading, shadowing, and perspective, have thus far received the highest degree of implementation for visualising many types of three-dimensional data. These systems however, display 3D information from only one viewer perspective which prevents the user from employing natural human depth cues such as stereo vision and motion parallax. Multiplexing methods that have attempted to introduce stereoscopic viewing capabilities into CRT displays have resulted in reduced viewing zones, and the need for the user to wear glasses or tracking headgear. None of the approaches that have been presented thus far has provided a complete method for displaying dynamic volumetric data without intrinsic limitations to visualisation. The display concept described in this paper has been demonstrated in a small scale proof-of-principle prototype, and provides a solution in which all of these visualisation parameters have an attractive range of values. A previous attempt to demonstrate this technique, made by Lewis, et. 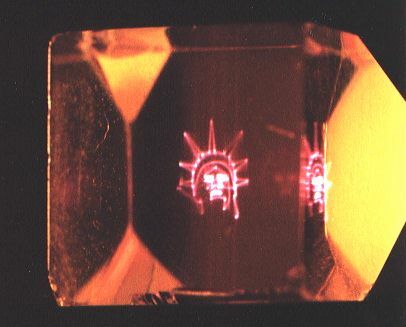 al., of Battelle Laboratories in the early 1970s succeeded in generating two faint spots of light inside a crystal of erbium doped calcium fluoride using filtered xenon lamps as excitation sources. The pioneering work of this group of researchers pointed out the potential advantages of such a display, and indicated that the shortcomings were primarily associated with the lack of suitable excitation sources and the lack of materials with sufficient infrared to visible conversion efficiency. We have utilised high power laser diodes in our work and improved upconversion materials, to lay the critical foundation for this 3D display technology. Of particular importance to the technique are the absorption cross sections and intermediate level lifetimes of the active ions, and the spectral distribution of the fluorescence. In this paper we describe the fabrication and optimisation of upconversion materials at Stanford University, and the integration of these materials with laser diodes and scanning systems to create a three-colour, solid-state three-dimensional display. The physical mechanism upon which this 3D display technology is based is known as two-step, two-frequency (TSTF) upconversion. This phenomenon occurs when an active ion, which has been doped in small quantities into a bulk transparent host material, is optically excited to higher energy levels by absorbing energy from two different-wavelength, near infrared (IR) laser beams. The active ion, which normally occupies its lowest energy level E0, can absorb energy from the first IR laser beam l1, making a transition to the intermediate excited state E1, where it will stay for the lifetime t1, of this level. If the second IR laser beam impinges on this ion while it is in the first excited state, it will absorb energy at the second laser wavelength l2, and undergo a transition to the second excited state E2. An ion that has been excited in this manner to the higher level E2, has effectively summed the energy it absorbed from both pump photons, and can re-emit most of it as a single photon of visible light by decaying back to the ground state. It is crucial that the two-step excitation process in the active ion occur only from the selective absorption of two different infrared wavelengths, as it is this mechanism that enables a visible point of light to be "turned on" only where the two laser beams cross, and nowhere else. By controlling the spatial co-ordinates of the intersection of the two lasers, a "voxel", or volumetric pixel, can be addressed at a specific location inside the bulk imaging medium. Rapidly scanning the point of intersection around inside the display volume, moves the position of the voxel, and allows three dimensional images to be drawn. The photograph above simple images that have been drawn in our prototype solid-state 3D display. The photograph was taken in ambient room lighting conditions and all the objects drawn in the display are easily visible. Red, green, and blue Lissajous figures were created in a stack of three individual glass layers that were laminated together with index matching optical adhesive to form a composite structure. Each layer was doped with a different ion and was pumped with the wavelength combination appropriate for that dopant. All of the wavelengths required to resonantly pump each of the necessary dipole transitions in these rare earth ions are commercially available as laser diodes at power levels greater than 100 mW from SDL Inc. (Table 1). Simple mechanical scanners, driven by function generators at rates of 30 Hz to 100 Hz were used to deflect the laser beams into the 1.5 cm x 1.5 cm x 1.5 cm composite sample. Both resolution and voxel size in this display are determined by the diameters of the intersecting laser beams which when focused to 100 mm spot sizes, would produce roughly 300 voxels along the perimeter of a 1.0 cm diameter circle. The transparent host materials used for this display are heavy metal fluoride glasses (HMFG) doped with praseodymium (red), erbium (green) and thulium (blue) rare earth lanthanides . These glasses, the most common of which is ZBLAN have been developed for fiber laser and optical amplifier applications and are characterised by low (<500 cm-1) phonon energies, a critical parameter leading to reduced nonradiative losses and increased upconversion efficiencies. Low-phonon energy glasses offer several distinct advantages over crystalline material hosts. They are relatively easy to manufacture enabling device performance parameters to be investigated in a wide range of compositions. In addition, they can be easily cast into a variety of shapes from which to construct a display volume. Glasses are isotropic and have no polarisation restrictions on pump lasers, assuring that light is emitted isotropically from any voxel. Glasses also introduce inhomogeneous broadening into the electronic transitions of the active ions, creating absorption resonances that are several tens of nanometers wide. While this feature facilitates pumping with laser diodes, as absorption is insensitive to wavelength drift, feedback susceptibility, and astigmatic focusing, it can reduce the absorption cross sections and increase single frequency upconversion. Glass ceramics , which offer the fabrication ease of glasses along with increased absorption cross sections, may provide improved materials for this display technology. Various fluoride glasses were fabricated by melting optical grade precursor materials in vitreous carbon crucibles under a reactive atmosphere of 3% Cl2 (balance N2). Melting temperatures between 700o C and 850o C were used, with homogenizing soak cycles ranging from 1.0 to 1.5 hours. Rapid quenching of the molten sample material was accomplished by removing the crucibles from the heat source and introducing connective cooling with dry N2 gas. Samples on the order of tens of cm3 with no observable crystals under 20X magnification were routinely prepared. The trivalent rare earths are well known for their ability to absorb infrared energy and become excited to higher metastable quantum states. Their 4f electronic levels are well shielded from the ligand fields in crystalline and vitreous hosts by the outer 5s and 5p electrons, yielding long lived metastable lifetimes. Figure 3A show the energy level diagrams of the lanthanide ions used in our display, along with the pump laser wavelengths and fluorescent emission lines. The 2S+1LJ notation used to label the various levels in these ions refers to the spin (S), orbital (L), and total (J) angular momentum quantum numbers of the free ions. Selection rules based on these quantum numbers govern transition probabilities between the atomic levels. In equation 1, P1 and P2 are the powers of the two pump laser beams and A is the area of the focused spot,  is Planck's constant, wij are the transition frequencies between the levels, NT is the dopant concentration, V is the voxel volume, s1 and s2 are the ground state and excited state absorption cross sections, and t1 is the lifetime of the intermediate level. The term x is the fraction of the light emitted in the useful bandwidth, and can be obtained from a calculation of the branching ratios to the different final states. Equation 1 assumes perfect overlap of the two pump lasers. Using a 0.5% (NT = 2.5x1019 cm-3) erbium doped HMFG, which has an intermediate lifetime of 15 ms, and ground state and excited state cross sections on the order of 10-20 cm2, a 100 um3 voxel can be excited to emit 0.5 uW of total power (the equivalent of that emitted by a single pixel in a high intensity CRT or LCD display) with approximately 20 mW of pump power from each laser. This assumes optimum pumping conditions in which the wavelengths of both lasers are resonantly matched to the transition frequencies wij, of the dopant. Voxel brightness is maximised when the excitation periods are greater than or equal to the intermediate level lifetime t1. The lifetime of the intermediate E1 level, should be long enough to allow efficient filling by a cw laser, but short enough to prevent "ghost" voxels from being created at previously scanned locations. The lifetime of the excited E2 level, should be short enough to allow dynamic objects to be drawn without smearing the image. Commercial diode lasers are capable of output powers from hundreds of milliwatts to several watts (7 ) and can readily provide the pump power needed to implement this 3D display technology. Materials with larger absorption cross sections and longer intermediate lifetimes will provide better performance by reducing the power requirements of the display. Red upconversion fluorescence was induced in trivalent praseodymium, Pr3+, doped fluoride glass by pumping with 1014 nm and 840 nm respectively. The absorption cross section of the 3H4 to 1G4 transition is small, partly because it is forbidden by spin selection rules. The 1G4 level has a lifetime as long as 0.325 ms depending on the material host and dopant concentration . The 1G4 to 1I6 transition in the Pr3+ ion has an absorption cross section that is two orders of magnitude higher than the ground state cross section (14). Energy absorbed into the 1I6 level, quickly relaxes to the nearby lower 3P0 level via nonradiative processes, and is emitted predominantly as red light at 605 nm (3P0-3H6) and 636 nm (3P0-3F2). Two-step, two-frequency upconversion fluorescence to green was induced in trivalent erbium doped fluoride glass. All of the relevant transitions in erbium are spin allowed yielding high absorption cross sections. The green emission shown is at 545 nm and has been induced in an erbium doped sample using pump wavelengths of 1.5 mm and 850 nm. It is important to note that erbium doped materials are also subject to single frequency upconversion when pumped with 1.5 mm, especially at dopant concentrations greater than a few mole percent. This phenomenon has been used to make single frequency pumped erbium upconversion lasers but is detrimental to the TSTF absorption processes needed for 3D display applications, as it will make the 1.5 mm pump laser beam itself visible inside the display volume as a green line. Single frequency upconversion in erbium is a higher order, intensity dependent process that requires at least three 1.5 mm pump photons to be absorbed to produce one at 545 nm. Scanning the pump laser beams inside the display at a sufficiently high rate decreases the excitation period, and reduces single frequency upconversion in erbium to a magnitude where it is not noticeable to the viewer. Upconversion fluorescence to blue at 480 nm, was induced in trivalent thulium doped fluoride glass . The first transition in thulium (3H6 - 3H4) is resonant with 800 nm, and the second step with 1120 nm. The square, blue surface area shown in the photograph was pumped with a second step wavelength of 1064 nm from a Nd:YAG laser. Although the second pump wavelength was more than 60 nm off resonance from the peak absorption frequency of the transition, the TSTF process was still induced in the glass host. While this illustrates the advantage of using vitreous materials when pumping nonresonantly, exactly resonant excitation of this transition will lower the power requirement. Figure 4 shows the spectral content of the red, green, and blue fluorescence obtained from the TSTF pumping schemes in praseodymium, erbium, and thulium doped fluoride glasses. While each of these ions also yields some emission at other wavelengths, the primary colour components are in the indicated RGB bands, and it is merely fortuitous that the spectral peaks provide three saturated primaries encompassing the human visual colour gamut. A variety of system architectures can be envisioned in which to implement this solid-state 3D display concept to provide multiple, individually addressable colours. The three colours were drawn in materials with dopant concentrations of around 0.5 mole percent, a value that has been experimentally determined to maximise voxel brightness. Higher concentrations of the dopants lead to decreased upconversion efficiency due to cross relaxation between the ions which depletes the populations of the intermediate levels. This, unfortunately, has prevented codoping all three ions into a single monolithic bulk medium to obtain wavelength addressable colour. The problem of mixing the dopants is compounded by the pump wavelengths used to induce TSTF upconversion in one ion, inducing single frequency upconversion in another ion, even at total dopant concentrations below 0.1 mole percent. Single frequency upconversion in other than the target ion causes the infrared pump wavelengths to show up as visible lines in the display, and causes the spectral content of a single voxel to be composed of emission lines from multiple dopant ions with an overall voxel brightness that is weaker in magnitude. A better way to achieve a large scale three-colour system may be to implement a composite structure consisting of a repeated sequence of three singly-doped layers. In this configuration, the three individual colours would be addressed in three different thin (100 mm - 500 mm) material layers, each of which has been optimised with a different dopant and host glass composition. A broad colour spectrum, including white, could be created by controlling the intensity ratio of voxels in three adjacent layers, in much the same way as colour is created by addressing three closely spaced pixels in a CRT display. Layering the display volume provides the added feature of spatially separating the wavelength pairs required to address each colour. This is an important consideration as erbium, for example, will undergo single-frequency upconversion when pumped with the excitation wavelengths for thulium and praseodymium. A three-layer stack of individual colours could be repeated over and over again to form the total display volume. This concept offers complete wavelength addressable RGB capability with one third the resolution of a monochrome device. A layered material system also intrinsically incorporates a parallel system architecture into its design. We define hp, the single voxel pump efficiency of the material, as the ratio of the total power emitted from a single voxel (Pv) divided by the total power (PT = P1 + P2) of the two input pump lasers, (hp = Pv/PT). Simple calculations show that the total power required to pump N3 voxels can be given by PT = N3 Pv 1/hp, or ET /tex = N3 Ev /tex 1/hp, eq. 2 - where ET is the pump energy, Ev is the energy emitted by the voxel, and tex is the excitation period. Equation 2 shows that a voxel need not emit light continuously, but can be excited to emit a higher amount of energy for a shorter period of time (Pv = Ev/tex), if it is pumped strongly and refreshed again a short time later. A single voxel (N=1) that is pumped with 30 times the excitation energy for 1/30th of a second (PT = ET/tex), and refreshed once a second, will emit the same average power as one that is pumped continuously at PT. In order to address N3 voxels every 1/30th of a second using only two lasers, the scan rate must be N3*30 Hz. A 3 MHz scan rate would be needed to address 100,000 voxels, producing an excitation period of 0.3 ms per voxel (RS = 1/tex), and requiring a pump energy 100,000 times greater than that necessary to turn on a single voxel at 30 Hz. A pump energy this high would be above the damage threshold of most optical materials. The inadequacy of using only two pump lasers arises because only a small portion of the available power along each beam (~ 100 um) can be utilised at any particular instant to excite a voxel, leaving the remaining length of each beam to go unused. The overall efficiency of this system can therefore never be greater than the single voxel pump efficiency of the material, hp. If, on the other hand, a system design using parallel pump lasers to simultaneously excite multiple voxels along the length of each beam is employed, more of the available power in the lasers could be utilised, reducing scan speeds and data rates, and lowering the power requirements of the system. For example, two orthoganally-positioned linear laser diode arrays with one hundred emitters each, can address 10,000 voxels in a plane when turned on simultaneously. This yields a device efficiency equal to 100 times hp (100 P1 + 100 P2 = 10,000 Pv), or two orders of magnitude greater than a two laser system pumping 10,000 voxels. Lowering the power of the lasers is also attractive from a safety standpoint as any pump power that is not absorbed by the active medium will require filtering at the viewing surface of the display. Parallel system architecture, combined with appropriate multiplexing algorithms, would increase the device efficiency of the display beyond the single voxel pump efficiency hp of the material, by allowing for more effective utilisation of available pump power. Monochrome systems in which only one colour need be addressed would require only one dopant ion in the display medium and could be implemented with a similar parallel excitation architecture. In this case, the display volume could be either monolithic, or constructed compositely from layers or blocks of material which could be substantially thicker than the layers needed for a colour display. These layers could vary in dopant concentration, with higher doped layers placed farther away from the laser pump sources, producing an absorption gradient. This design could be used to balance the reduction in pump power that occurs as the ground state laser beam propagates through the material and is absorbed. A layered structure would also help to reduce some of the practical issues associated with casting a large monolithic piece of low phonon energy glass, as these materials have a low thermal conductivity and are difficult to fabricate in pieces thicker than a few inches. This would enable large displays having several inches on a side to be manufactured. The solid-state 3D display technology described in this paper can be driven entirely with commercially available laser diodes and scanning systems, and can be powered directly from 120 V, 60 Hz electrical outlets. The display operates at room temperature, and is viewable under typical ambient room lighting conditions. Current efforts are under way to implement a more fully integrated system architecture, and to increase upconversion efficiencies with improved material systems. We believe that this technique offers a viable approach for presenting real-time multi-dimensional information to a multitude of viewers, independent of viewing perspective, with no obstructed viewing regions, and no need for special viewing eyewear. The authors would like to acknowledge Randy Klein and Dave Evans of SDL Corp. for their valued technical assistance with laser diodes, and Nick Borrelli and Roger Bartholomew of Corning Inc. for performing lifetime measurements. 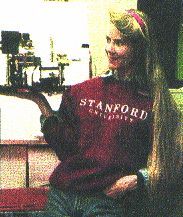 Elizabeth Downing would like to personally thank John Trias and Parvis Soltan of NRaD, two visionaries who believed in her enough to fund this research at Stanford three years ago under contract #N6600-92-D-0092. This work was also supported in part by L. N. Durvasula of ARPA under contract #N0014-92-J-1903 through the Stanford Center for Nonlinear Optical Materials (CNOM).